There are three main ways to propagate strawberry plants. The plants can be divided and transplanted once multiple crowns have been grown (or division of rhizomes), new plants can be grown from strawberry seeds, or the runners that strawberry plants put out can be controlled, guided, and caused to root where clone plants can be utilized most efficiently. There are positives and negatives about propagating strawberries with each method, all of which will be briefly discussed. However, to offer the bottom line up front, most gardeners will find that the easiest way is to propagate strawberry plants by runner. Many types of strawberry plants will, either by nature or if encouraged by pruning runners, put out lateral crowns at the base of the strawberry plant. These lateral crowns can be divided and replanted to propagate strawberry plants. Additionally, the genetically generative rhizomes of strawberry plants can, under the right circumstances, be divided into multiple pieces with each piece being sufficient to grow a new plant. There are, however, several drawbacks to this type of strawberry propagation. Often, the mother plant will be compromised (if not done correctly) and will die. Thus, the net increase of strawberry plants is diminished. Also, it tends to be more labor-intensive and technical as the division or cutting takes both precision and a bit of expertise. However, for well-funded or commercial operations, this division can be used to propagate cloned plants quickly and extensively. Visit the Strawberry Seeds page for the details on how to plant and start strawberry seeds and the Growing Strawberries page for help propagating strawberry plants by nurturing the seedlings into viable, mature strawberry plants. Growing strawberries from seeds has the potential for vast numbers of new strawberry plants to be grown. Each strawberry has approximately 200 seeds adorning its outer surface. While unusual for every seed to be viable, that is still a lot of new plants from a single strawberry. Starting strawberry seeds will require most of the standard seed-starting equipment to be used. And, while starting strawberry seeds often requires a few more considerations than does starting common garden vegetables from seeds, it is not overly difficult. The major drawback of strawberry propagation by seed is the nature of today’s common strawberry cultivars (visit the Strawberry Plant page for the history). Once the Garden Strawberry (Fragaria x ananassa) became the dominant strawberry grown in both home gardens and commercial operations, the seeds became unreliable due to the crossbreeding used to obtain the improved strawberry varieties. This means that attempting to grow strawberry plants from seeds that were collected from a purchased strawberry will likely not produce true plants. In other words, the plants grown from seed will be different from the plant that produced the seeds (sometimes substantially so). The seed-propagated strawberry plants will exhibit genetic traits of the grandparent plants instead of the desired parent plant. The wild strawberry species are an exception to this and will produce plants true-to-form. However, their fruits are much smaller, in general, and not recognized by most as the “strawberries” that are commonly bought and consumed today. Growing strawberry plants from a runner is, for most, the easiest and quickest way to propagate strawberries. Most of the June-bearing, everbearing, and day-neutral varieties produce runners. 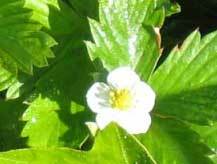 Some of the wild strawberry varieties do not and must be propagated by seed. But, in general, if someone buys a strawberry plant, it will produce at least a few runners. The strawberry runners are stolons. These horizontal stems are sent outward from the base of the strawberry plants. At variable distances new strawberry plants will form (at nodes). This is possible because of a strawberry plant’s ability to form adventitious roots. These specialized roots are formed at the nodes along a runner. Wherever these roots touch nutritious soil, they will continue to grow into that soil and establish a new clone plant that genetically identical to the plant that originally sent forth the runner. Due to this aspect of runners, it is relatively easy to propagate strawberry plants using them. The long, flexible intermodal parts of the runners allows them to be bent and positioned according to the desire of the gardener. To collect new clone strawberry plants, all one has to do is direct the runners so that the adventitious roots will grow down into a separate, moveable container. Any small container or pot properly filled with a sandy loam soil will work. It can be buried so that the strawberry plant runner will stay at ground level, or the pot/container can be placed on top of the ground so that it is more easily removed once the new strawberry plant is well-rooted and established. Either way, the runner can be held in place by clothespins, rocks, a pile of dirt, a couple of sticks, or anything else suitable for keeping the runner in position and the node portion in contact with the soil. Once the adventitious root has established the new clone plant, separate the new plant from the mother strawberry plant by snipping the runner. If it has been established for a while, the runners will eventually shrivel and snap on their own. But, as long as the new plant is well-rooted, no growth will be hindered by snipping or snapping the runners. Voila! You now have a new, transportable strawberry plant that you can sell, use to start a new strawberry bed, or use in some other imaginative way! For a new gardener, strawberry propagation by runner is usually the easiest and most successful means of acquiring new plants from existing ones. But, don’t hesitate to try the others if up to the challenge. Also, not all strawberry plants produce the same amount of runners. Check the Strawberry Varieties page for more details on specific cultivars, and, once you find one you like, you can find a supplier by using the Strawberry Plants for Sale page. I mistakenly cut the runners off the plants when putting them in pots – I want to know what I can do to save the young runner plants, as they have no help from the parent plant. Can I encourage root growth by keeping them in water for a couple of weeks with maybe some rooting powder dissolved in the water? Oh, my gosh–I just learned a new thing! Thank you! Here in Spokane, WA, USA, I always have tons of tree leaves and have been grateful for the free winter mulch. I have always had great success growing strawberries, but our summers are lasting well into fall now (with the berries keep going! ), and winters are becoming milder. The leaves do not have time to really break down over winter and it is warmer earlier in spring. So I have begun to notice an awful lot of sliminess on the soil and slower spring growth on my everbearing plants. Now I think the leaves are just not good for them–I always did think it was funny that I would lose a lot of the leaf mulch in early winter winds, then the plants would sit kinda bare under the snows, and I would worry about how they were doing. But each spring and set to making berries and runners like nobody’s business. And, of course, the light leaf mulch had broken down into freeze dried tiny bits. So, even though my plants are–it is mid-June–making berries nicely now–I am going to use newspaper, I think, this winter, and see if I can get back to more vigorous, larger plants, and more runners next spring. Great tip. Hi I have read most of the above but it doesnt give me quite the answer I am looking for. I have existing plants which I think are 2 years old and they are producing runners. I understand what needs to be done regarding these but what do I need to do to my existing plants after removing dead leaves or weak plants etc. I had a brilliant crop of strawberries in December (New Zealand) and would like to try and achieve the same this summer. To keep my existing plants maintained I guess I fertilise but do I need to put straw under them to keep the leaves off the ground? Is there anything else I need to do? Every three years in early October (in Louisiana), I remove all plants from their large container (raised bed) and replenish the soil with a little more potting soil or peat/perlite mix. I add a bag or two of compost (about 1/3 of the new volume) and mix thoroughly. I shake off each plant, cutting any runners if the baby plants are established with their own roots. After planting, I put leaf mulch or cypress mulch between them. I don’t have to cover them because the plants easily survive our winters (light to moderate freezes) in a state of dormancy. As soon as the days lengthen, the plants green up. My Eversweet strawberries had blooms on them on December 29th. I should have strawberries by January 28th! I have a wild variety of strawberry that does not put out runners. It does have a number of rhizome crowns that I would like to separate. would mulching over the whole plant during fall / winter be the correct way to protect it ? Thanks for any advice. Right now through the end of October is actually a great time to divide and re-plant the additional rhizomes. I’d point you to this for overwintering advice. Good luck! I live in zone 5B. What do I need to do to protect the strawberries over winter? Both them and the pineberries both starting sprouting runnings all over the place and i’m finally starting to fill my raised garden bed. Thanks for your help. If I propagate from runners, but I don’t want to plant the new plants until spring, what is the best way to overwinter them? Will they be fine in their little pots in an unheated greenhouse (zone 7) over the winter? As long as they are in pots and watered enough to keep the soil from drying out, they will likely do just fine in Zone 7. Good luck! 2. Yesterday I noticed few holes in the strawberry leaves. Would like to know what treatment I can give to the leaves. Nothing will remedy the damage done to the leaves. However, some insect probably made the holes. You can try diatomaceous earth as a remedy. Good luck! I planted a new raised strawberry bed last summer. The plants put out runners and filled the bed. Everything looked great. However, during the winter mice got into the bed and made tunnels and ate the roots of many plants and runners. Also, the soil settled quite a bit. I had a very small crop of berries this summer. I need to add more soil to the bed and I think I should transplant some of the plants to other parts of the bed. Any recommendations on when to do this or other tips? I’d recommend working through each section here. See especially the link on transplanting! Good luck! If you just planted them a couple of weeks ago, I’d just give them some time and the tender loving care they need to be happy and healthy. Good water, good sun, good location usually make for happy plants. Transplanting puts stress on them also, so as long as they aren’t wilting and/or turning brown, they should perk up soon. Good luck! i want to induce my strawberry plants to produce runners, its summer here in the phillipines and it seems that my plants insists on bearing fruit, however its not what i wanted for the moment. Typically, most strawberry plants don’t start producing runners en masse until they are finished producing the majority of the year’s strawberry harvest. So, I’d recommend just waiting a couple of weeks until the plants are finished setting their berries. Soon thereafter they should start putting out runners. Good luck! I have around 100 rooted strawberry runners (in3-4in pots). I plan to plant them through a permeable weed suppressing membrane. Is it still ok to plant them out in the ground at this time (early November)? Can I expect some crop the coming summer? If you live in Zone 8 or higher, you should be able to plant them now without much risk. There is some risk if you plant them in Zone 7 or lower, but I would recommend going ahead and giving it a try. Especially if the plants are well-rooted in their 3-4 inch pots and you are gentle when transplanting, they will likely do just fine. If the ground is already frozen in your area, however, they likely won’t make it. Good luck! we planted strawberries this season, while the plants grew well, no berries were actually produced. trying to get some starter plants going to try and continue to grow over the winter. Any thoughts to why the plants didn’t produce any berries? If the plants have difficulty establishing themselves, they will often not produce berries. Also, if the plants haven’t lived through a fall season, they won’t have developed any perennating buds. The following year’s strawberry flowers and strawberries come from the perennating buds that are formed the previous fall. So, some tissue-culture strawberry plants won’t have developed any yet. Continue to care for your plants, and they should produce well for you next spring! Good luck! How do you know if your clone is rooted well enough to snip the runner? When the plant remains firmly affixed and feels stable with a very gentle tug, the plant should be rooted well enough to support itself. If you aren’t sure, check the actual stolon connecting the plant to the mother plant. If it is dry and brittle, snip away! Good luck! hello so I’m confused on propagation from mother plants are you saying that even after 4 years i can keep propagation runners even if the mother is not producing?? If the mother plant is putting out new runners, yes. Those runners can be rooted and transplanted. Good luck! I have 3 first year plants of different types of strawberry. Only one of them produced some fruit this summer but this one had no runners, the other two had several runners each with at least 5 plants. I’m in NJ and the runners are starting to dry out. Can I still follow your video on this? Will the new plants still root or can I dry them to plant next year like the ones you get in the store? If the runners between plants/nodes are already drying out and the plants are not yet rooted, they will likely die. If the plants/nodes are rooted and the runners are drying out, they should live. You can’t, however, dry them out or they will die. After the plants enter dormancy, they can be stored, but they cannot be dried completely out without dying. Good luck! i’ve purchased strawberry runners from bunnings and they came in a bag of five and they had been dried outand bundled together, can i plant these straight away or do i have to prepare the runners before planting? Soak the roots in water as soon as you take them out of the package, and plant them right away! Good luck! Hi! I was at a local hardware store and asked about strawberry plants, and the gentleman there was kind enough to give me a few of the runners that they were planning to just throw away. They were a bit wilted but when I got them home I cut the stem of each and put them in some water, and they have perked up beautifully! Will the stems root if I leave them in the water, or would it be better to plant them right away in soil and if so what is the best way to go about doing that? Thanks for such an informative page! Yes, go ahead and plant them. See this page for help. Good luck! There’s one thing that has always confused me. When you say “after four years the plants’ vitality diminishes”, does that include the clones? Will the clones die off with mother plant after 4 years? Or can you keep cloning clones forever? There is some disagreement here amongst the strawberry aficionados, but you can generally assume that strawberry plants can be cloned indefinitely with care, and that a 1-year-old clone plant can be considered 1 year old, even if the mother plant it derived from is older than that. Good luck! Wouldn’t it be nice if you could just plant a strawberry in a cup and have the green top sprout into a new plant like you can do with a pineapple? That indeed would be fantastic! They do propagate by runners, though, which is sort of similar. Good luck! Yes, after four years the plants’ vitality diminishes. Read more here about transplanting strawberries. Good luck! I am propagating the runners. Do I still use the parent plant next season or discard it. Unless the parent plant is over 3 years old, I would definitely allow it to remain and set a harvest for you. Strawberry plants generally don’t decline until their 4th or 5th year, if cared for properly. Good luck! The area that my strawberries have to go in has poor soil drainage on 1/3 of the area. What could I do to the soil to make it better for the strawberries that I want to put transplant there this August? Thank you! Make the area with poor drainage an elevated bed to assist in clearing water from the roots. Good luck! My original plants have spread and now new plants are growing on their own outside of their growing tire. Can I pull the plants up and trim their tops and store the rhizomes for winter? That way in the spring they can be planted else where. Also how and in what would you recommend storing them? You can store them, but you’ll need to induce dormancy first. It is easier to allow them to root where they are, continue growing their roots into the soil (the more roots the better, usually), and then carefully dig them up once they have gone dormant with the colder weather after the growing season has ended. This might help also: storing bare-root plants. Good luck! After cutting back the plants before winter, can leaves be used for mulch? Yes, but only if there are no other options available. Leaves harbor fungus and can end up introducing pathogens that will kill your plants. I’d use anything else first, even shredded newspaper will work fine. Good luck!